Many people have problematic veins that are too twisted to be treated with the laser fiber or too small and numerous to be removed with microphlebectomy. The physicians at The Vein Institute rely on their ultrasound expertise to inject a solution precisely into the problem veins in a technique called ultrasound-guided foam sclerotherapy. The solution irritates the vein lining, causing them to shrink and close. 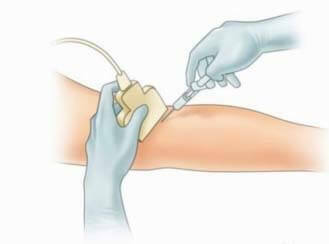 Ultrasound-guided sclerotherapy is a technique for closing troublesome incompetent refluxing veins and varicosities. With this treatment, a chemical irritant called a sclerosant is injected into the vein to be treated, rather than heating it closed. It causes the inner lining of the targeted vein to become irritated and the vein then closes. This can be used in conjunction with or in place of EVLT. This is especially useful in situations where the veins are too close to the skin to be heat sealed (risk of burn), too tortuous (many turns and bends), or too numerous for a single laser treatment to be successful. This very specialized treatment is used in complex cases, often for patients who previously had a vein stripping that failed. Advanced Therapies at Rochester Radiology is one of the only practices in the area to provide this treatment. Ultrasound-guided sclerotherapy is a technique for closing troublesome incompetent refluxing veins and varicosities. With this form of treatment, a chemical irritant called a sclerosant is injected into the vein to be treated rather than heating it closed. It causes the inner lining of the targeted vein to get irritated and the vein then loses. This can be used in conjunction with or in lieu of RFA. This is especially useful in situations where the vein is too close to the skin to be heat sealed (risk of burn) or when the veins are too tortuous or numerous for a single ablation treatment to be successful. Ultrasound imaging is used before (to locate the target section of the vein), during (to monitor the therapy), and after the procedure (to ensure the treatment has been completed and larger veins have not been damaged). The chemical agent we use is called sodium tetradecyl sulfate (STS), better known as Sotradecol. The agent itself is FDA-approved in the U.S. for closing veins. We inject a foamed version of Sotradecol mixed with air, which specifically is not FDA-approved, but has been successfully used for years by vein specialists such as our group for the purpose of ablating incompetent veins. previously had vein stripping that has since failed. The Vein Institute is one of the only regional practices to provide this type of specialized treatment, and we perform a lot of these procedures. Are there any limitations in what I can do after my ultrasound-guided sclerotherapy procedure? You may resume normal daytime activities but should avoid sitting or standing still for long periods immediately following the procedure. Walking is encouraged, especially after the procedure. You may continue with normal exercise activities such as cardio workouts (running, treadmill, elliptical, etc.). Avoid strenuous exercise that engage your core such as Pilates, Zumba, core training, heavy weightlifting, and abdominal crunches/sit-ups for the first two weeks following the procedure as well as any other activity that increases abdominal pressure. Avoid hot tubs, saunas, and other similar activities for two weeks following the procedure as these cause veins to vasodilate, and may open up the treated vein. Avoid flights or long drives of greater than 4 hours duration for at least 3 weeks after treatment. If travel is unavoidable, it is recommended to either take breaks from driving or get out of your plane seat every 60-90 minutes. Please let your doctor know of any planned travel. What can I expect following ultrasound-guided sclerotherapy? Mild pain persists for several days. The degree is related to the initial size of the veins and their location. Pain is usually improved by walking or by taking Tylenol first. If this does not work, you may take Ibuprofen (Advil or Motrin). After the procedure, you may feel some inflammation and bruising on the skin surface overlying the treated areas. Over the next few days, you may also note that the area where the vein was ablated will feel a “rope-like tightening” or “rubber band-like” feeling. Soreness can occur in the leg, especially behind the knee, from the tight compression and/or rubbing by the bandage or compression garments. Darkened discoloration and tender lumps over veins which are closing may develop, particularly after subsequent sclerotherapy. They usually disappear within 4-6 weeks, but some big veins may feel tender and lump for up to 3 months. This indicates that treatment has been successful. Infrequently, lumps may need to be pricked to let out ‘trapped blood’. Recurrence. Treated veins can reopen or new veins can develop. For this reason, ultrasound surveillance is carefully performed at all follow-up exams to ensure closure. In general, we tell our patients that the first two weeks with the bandages/compression stockings will be the recovery time as the vein closes. Many patients notice an improvement by the night of Day 3 when the compression stocking first comes off. By the one month follow-up visit, generally all the mild pain, bruising, and tender lumps should be dissipating, if not gone all together. Many of the symptoms will usually start to improve by this point. If not, then some of that ‘trapped blood’ may need to be expressed at the follow-up appointment. At the 3 month follow-up visit, many patients have complete resolution of symptoms and varicosities. Follow-ups at 6 months and 1 year are reserved for challenging cases for surveillance. We will take ‘before and after’ pictures to show progress. What are the possible complications from the ultrasound-guided sclerotherapy procedure? Severe bruising and pain during the weeks after sclerotherapy which generally resolves after a few weeks. Notify us if you take or start taking blood thinners (Aspirin, Plavix, Coumadin, Heparin, etc.) and this occurs. Prolonged redness and tenderness around the puncture sites or over the treated vein segment. This may also occur with watery fluid noted from the puncture site. This may represent a mild superficial infection/inflammation at the vein site called thrombophlebitis. If you see pus from the puncture sites, call us immediately or go to the Emergency Department as this may be a sign of a more serious infection. Deep vein thrombosis, which are clots extending into the important deep veins, can occur. This potentially serious complication is very uncommon if the protocol of compression and regular daily walking are followed. 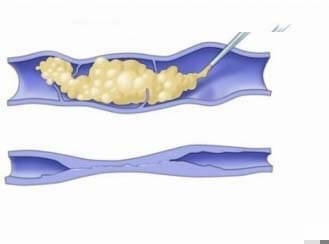 If this is demonstrated on the postoperative scan, you may require treatment with daily heparin injections until further scans show the clot is resolving. There have been reports of headache and possibly even of stroke associated with simple ultrasound-guided sclerotherapy. This is extremely rare and can develop if the foam sclerosant leaks into the deep vein and then travels across a persistent opening in the heart called a patent foramen ovale. If this were to occur, theoretically it would occur at the time of the procedure. We perform thousands of these procedure each year at The Vein Institute and all of the above are exceedingly rare complications.